I haven’t seen Peterson et al (2013) presented alone yet at WattsUpWithThat. It was referred to in Jim Steele’s excellent WUWT post Fabricating Climate Doom – Part 3: Extreme Weather Extinctions Enron Style. Four key types of climate extremes (i.e., heat waves, cold waves, floods, and droughts) were assessed. The data indicate that over the last several decades heat waves are generally increasing, while cold waves are decreasing. While this is in keeping with expectations in a warming climate, decadal variations in the number of U.S. heat and cold waves do not correlate that closely with the warming observed over the United States. The drought years of the 1930s had the most heat waves, while the 1980s had the highest number of cold waves. River floods do not show uniform changes across the country; flood magnitudes as represented by trends in annual peak river flow have been decreasing in the Southwest, while flood magnitudes in the Northeast and north-central United States are increasing. Confounding the analysis of trends in flooding is multiyear and even multidecadal variability likely caused by both large-scale atmospheric circulation changes as well as basin-scale “memory” in the form of soil moisture. Droughts too have multiyear and longer variability. Instrumental data indicate that the Dust Bowl of the 1930s and the 1950s drought were the most widespread twentieth-century droughts in the United States, while tree ring data indicate that the megadroughts over the twelfth century exceeded anything in the twentieth century in both spatial extent and duration. My Figure 1 is Figure 1 from Peterson et al (2013). Fig. 1. 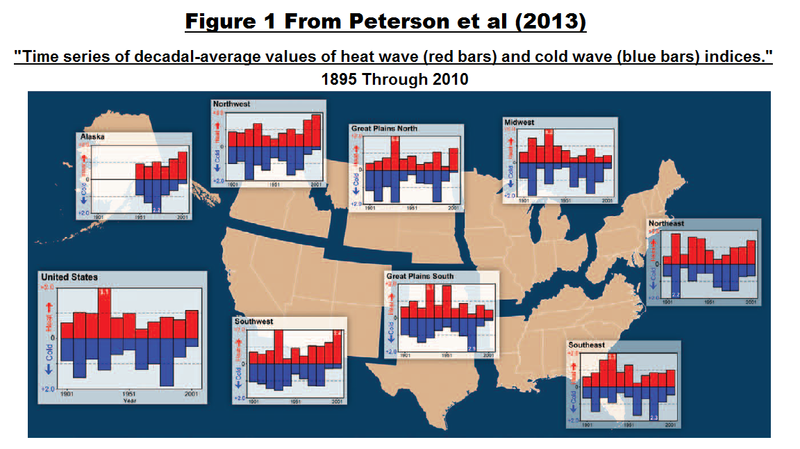 Time series of decadal-average values of heat wave (red bars) and cold wave (blue bars) indices. These indices are a normalized (to an average value of 1.0) metric of the number of extreme temperature events for spells of 4-day duration. An event is considered extreme if the average temperature exceeds the threshold for a 1- in 5-yr recurrence. The calculations are based on a network of 711 long-term stations with less than 10% missing temperature values for the period 1895–2010. The horizontal labels give the beginning year of the decade. Recent decades tend to show an increase in the number of heat waves and a decrease in the number of cold waves but, over the long term, the drought years of the 1930s stand out as having the most heat waves. See the SM for details on the daily data used in this analysis and procedures used to calculate the indices. And to confirm the discussion of drought from the conclusions above, Peterson et al (2013) presented their Figure 4, which I’ve included as my Figure 2. Fig. 4. The percent area of the contiguous United States experiencing moderate to extreme drought [Palmer drought severity index (PDSI) ≤ –2.0] from January 1900 to October 2012 (red curve). Widespread persistent drought occurred in the 1930s (central and northern Great Plains, Northwest, and Midwest), 1950s (southern Great Plains and Southwest), 1980s (West and Southeast), and the first decade of the twenty-first century (West and Southeast). The dotted line is a linear regression over the period of record (linear trend = +0.09% decade–1), the solid line is for January 1931–October 2012 (–0.78% decade–1), and the dashed line is for January 1971–October 2012 (+3.70% decade–1). Yet some members of the climate science community and the mainstream media continue to spin tall tales about weather growing more extreme in recent years. Nothing but nonsense. Thanks for featuring this fairly solid report, Mr. Tisdale. Re: river flooding, just a minor thought: up here, in the upper left corner of the continental U.S., the Fantasy Science Club has such strict regulations in place that fairly large rivers are no longer dredged. They flood, thus, much more readily, now. Hope (and I pray for you, too!) the book is coming along steadily. 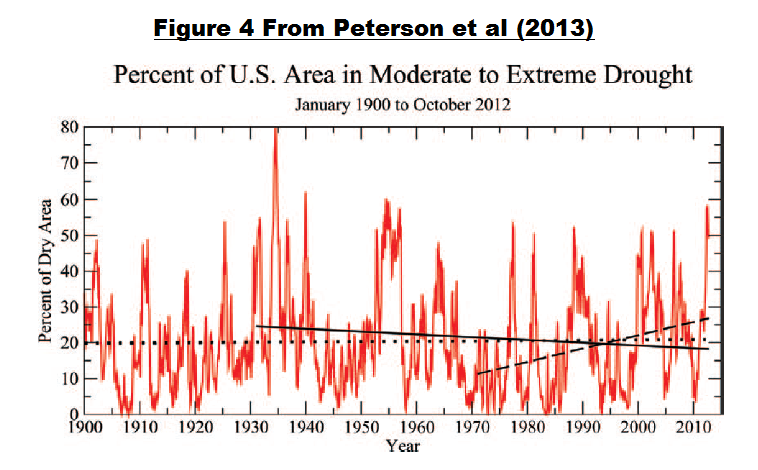 Extreme weather is a phenomenon totally unrelated to climate. How long do we need to understand that fact? Droughts, floods, tornados, hurricanes, tsunamis, No’reasters, thunderstorm lines, rain storms, wind, snow, sleet, ice storms are all weather. Combined with all nice days, they are climate. Hi, Janice Moore. Thanks for the prayers. The book has been progressing well.